For both Long and Short Walks please meet at the Community Centre from 10.15a.m to leave at 10.30a.m. Looking forward to seeing you all, plus volunteers as Walk Coordinators and any suggestions/ideas for our programme. Future walk dates. Please let Chris or Janet ( 01208 871784) know if you would like to organise a walk. WE WILL PARK IN THE FREE CAR PARK BEHING THE SOCIAL CLUB (PL13 2LG) – TURN RIGHT JUST BEFORE THE CHURCH AND THE CAR PARK ENTRANCE IS IMMEDIATELY ON YOUR RIGHT. THERE ARE BUSES TRAVELLING BACK TO PELYNT AT 13.15, 14.15 AND 15.35. THE JOURNEY BACK LASTS 13MNS. 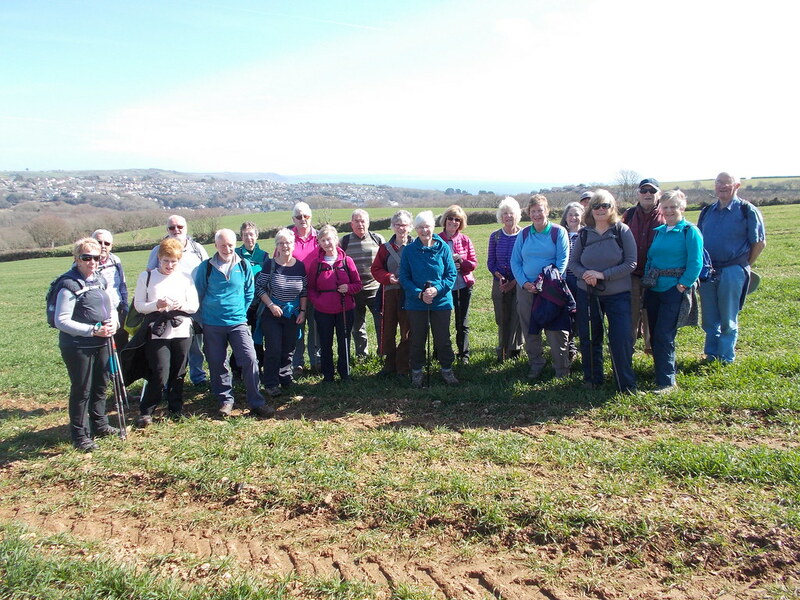 What a great day for a walk after a cloudy start but by the time we had driven to the National Trust Car Park on the North Cliffs above Deadman's Cove the sun was shining and fourteen of us were ready to start our 6 mile circular walk. 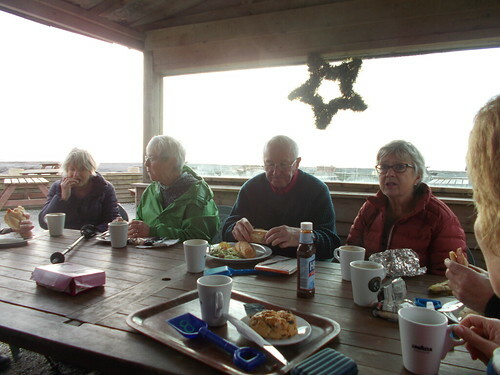 Starting along the coast path we took a detour to have a tea/coffee and some of us something to eat at Hells Mouth café. 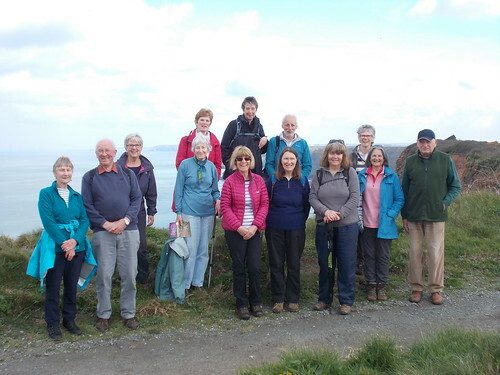 Our formal photo was taken just off the coast path with the sea as the background. Retracing our steps past three other smaller car parks we then returned to the car park to head south through fields to arrive in Coombe on the western side of Tehidy Country Park. The manor of Tehidy was owned by the Basset family until 1916 and shortly after the manor was sold it was converted to a hospital which was devastated by fire just two weeks after opening. 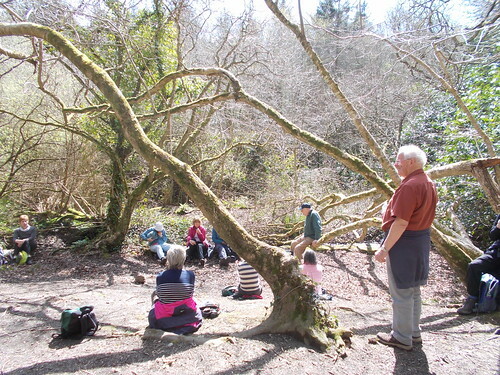 The grounds were subsequently developed by Cornwall County Council and it now is the largest area of woodland in West Cornwall-so we were told by Sue!. In the centre there is now a private development of residential houses which we were to go past on our route finally to the North entrance. Time for lunch on the walk through the woodlands with a stream running alongside the path. Our leaders also took the time to contemplate-probably which walk to do next or which café can we stop at!!! In fact we did come across another café at the South entrance but rushed quickly by to head along a permissive path through the woodland and past an impressive beech tree with twisted roots to the North car park and access to the coast path again. 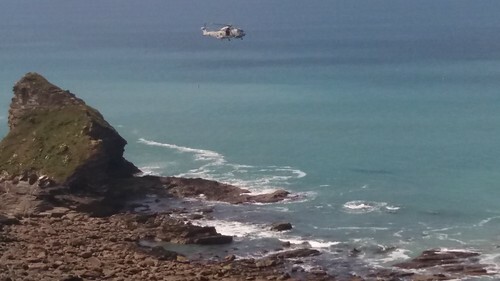 We all watched as a helicopter was, we assumed training, hovering low over the sea and then moving on before coming back again to redo the manoeuvre. Just another 30 minutes and we were back at the car park and the 50 minutes drive back home -still with good weather although rain did come at about 5.30pm as predicted. 3) YOU WILL NEED TO BRING PICNIC LUNCH BUT THERE WILL BE TWO OPPORTUNITIES FOR DRINKS AND TOILETS-ONE AT ABOUT 11.15AM. 4) WE WILL BE MEETING AT COMMUNITY CENTRE AT 9.25AM FOR 9.30AM DEPARTURE AND ABOUT 1 HOUR DRIVE TO START POINT AND RETURNING AT ABOUT 4.00PM. WE WILL BE STARTING THE WALK AT NATIONAL TRUST CAR PARK ON B3301 SOUTH WEST OF PORTREATH-POST CODE AND REFERENCES CAN BE GIVEN IF REQUIRED. COULD YOU PLEASE LET US KNOW BY SATURDAY 6TH APRIL IF YOU WANT TO GO ON THE WALK AND IF YOU CAN OFFER TRANSPORT. 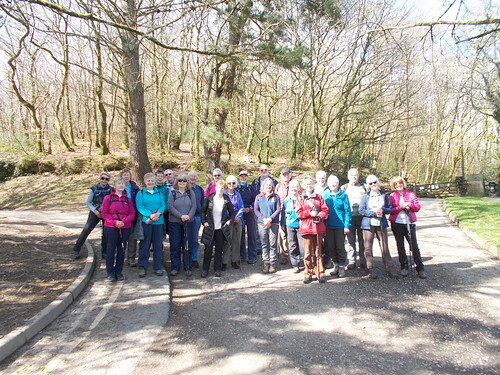 This was a 4.5 mile circular walk which was a repeat of a similar walk done in October 2015 when on that occasion 8 walkers completed the walk. 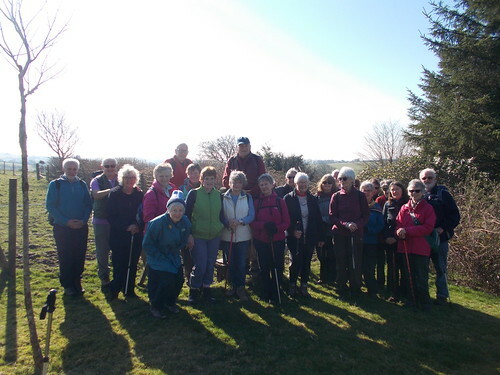 On this very sunny and glorious March day 23 walkers gathered at Hannafore to start the walk past the bridge and through the large car park to reach the climb through the woods. A photograph was taken at this point whilst we were still in fine fettle. 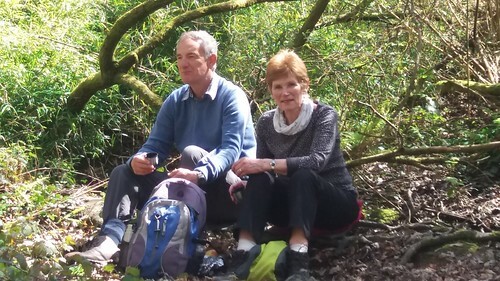 After climbing first through the woods,over a stile and through a large agricultural field we reached our summit and another photograph showing the coast line behind us. After a short walk following the footpath signs we reach the cottages rented by Hoseasons and then our downhill bit to sea level and the estuary with the tide fast going out leaving mud flats and wading birds. A levelish walk now along the estuary, a bit slippery in places, and towards West Looe and with the time about 12.45pm we reached our six picnic tables and time for a bite of lunch. After a very pleasant break,particularly for those sitting in the sun, we headed towards the large car park and for some time to return to Lostwithiel whilst for others a visit into East Looe to sample some of the goodies before walking back to Hannafore and ,with the sun still shining, to return home. 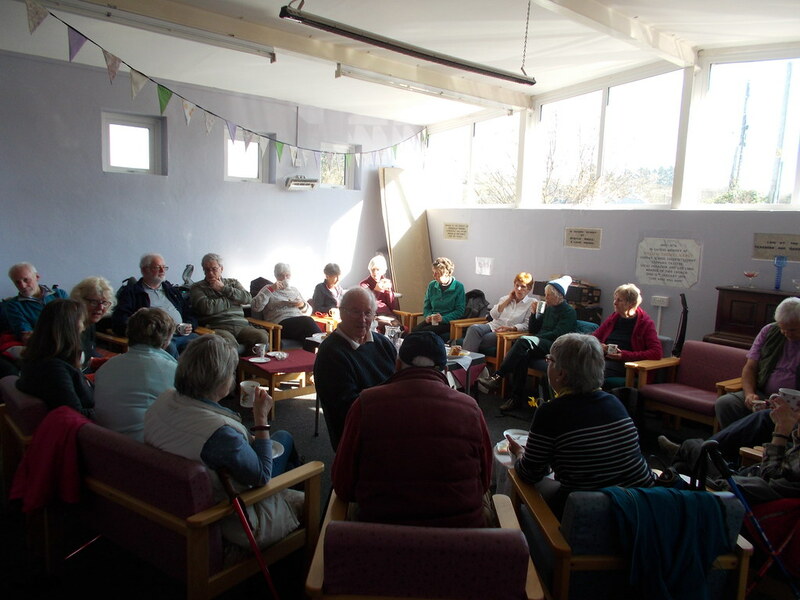 4) ADDITIONAL REFRESHMENTS AND TOILETS AVAILABLE IN LOOE. WE WILL BE MEETING AT COMMUNITY CENTRE AT 10.10AM FOR 10.15AM DEPARTURE TO PARK AT HANNAFORE FOR 10.55AM DEPARTURE BY FOOT. COULD YOU LET US KNOW BY SATURDAY 23RD MARCH IF YOU WOULD LIKE TO COME AND CAN OFFER TRANSPORT. On a day when news broke that Siblyback Lake will no longer be the venue for sailing and other water sport events a near record of 24 members set off on a glorious February day with clear blue sky to walk the 4. something mile circular walk. The temperature was near to 16-17 degrees centigrade when we started the climb with one of our group showing off his bare legs and getting that first tan of the year. Using the footpath we headed south east towards Crylla Farm and over many stiles and steps to then head downhill towards our surprise and promised eleven's destination of the village hall at Common Moor. Entering through the main door the group were met with comfortable chairs in a circle with two excellent cakes and home made sausage rolls laid out on a table in the middle and volunteers from the community ready to serve teas and coffees. What a treat which will take some beating. Following the minor road and then a footpath along side a babbling stream we made for the road we drove in on and then to a footpath at South Trekeive where we crossed several fields, with magnificent views of the bright blue lake, to head towards the dam before circumnavigating the water in a clockwise direction to get back to our cars after another new walk in conditions that turned out to be better than the Caribbean. WE WILL MEET AT COMMUNITY CENTRE AT 10.00AM FOR 10.05AM DEPARTURE. Seventeen members of the group had signed up for this 5.75 circular walk, courtesy of the invaluable resource: iwalkcornwall. The weather forecast has been for light cloud and light wind. However, the closer we got to Kit Hill, the mistier it got, and you could not see any of the landmarks of Kit Hill. Our first stop on the way was Louis’ Tea Rooms close to Kit Hill where we ordered our lunch booked for 1.30pm – something to look forward to whatever the weather! 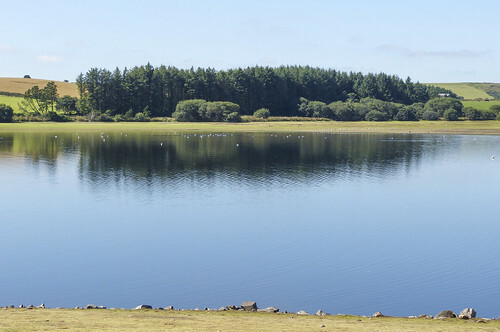 Kit Hill Country Park which includes the hill and surrounding area, was donated by the Duke of Cornwall to the Cornish people to mark the birth of Prince William in 1985. The name “kit” comes from the Old English word for a bird of prey and the Country Park still has a population of buzzards and sparrowheads. Kit Hill is one of five hills in Cornwall designated as Marilyn Hills (coined to contrast with Munros). The other four hills, all protruding above the surrounding land by at least 150 metres, are Brown Willy, Watch Croft, Carnmenellis and Hensbarrow Beacon. Kit Hill only just qualifies as a Marilyn Hill being 171 metres above the surrounding land. We first made our way to a chimney which we could see only as we got close to it. The mining activity on Kit Hill has been mapped and is said to contain over 1000 shafts, pits and trenches in search of mineral ore. Minerals extracted included tin, copper, lead, silver and tungsten. South Kit Hill Mine opened in 1856 and closed in 1874 and reached a maximum depth of over 100 meters. We then made our way to the tower on the summit of Kit Hill, the remains of a chimney stack for the steam engine used by the Kit Hill United mining complex. It is now festooned with transmitters and all-important lightening conductors, being the highest point for miles. There are some useful plaques all round the base of the tower explaining what you can see in all four points of the compass. Due to the mist, we had to use our imagination! On the way down to the quarry, we walked past a rock channel crossed at intervals by granite slabs. This was a flue which carried arsenic vapour. As we approached the quarry, the mist started to lift and we could see the patchwork of fields down below. The quarry at Kit hill was for high quality granite. Large scale quarrying began in the 1880s and the granite was used for sea defences in Plymouth, London and even Singapore. The stone was shaped and finished in the quarry before being shipped as completed pieces via the railway. After a 15mns refreshment break by the quarry, we walked down a steep incline and by then the mist had totally lifted. We could even see the mast on the top of Caradon Hill. The inclined worked on a balance system where a load of granite from the quarry descended as another load e.g. coal for the steam engine was raised. The granite was lowered onto sidings which connected to the East Cornwall Mineral Railway. We then walked on minor roads, bridle paths and footpaths to reach Kelly Bray. Kelly Bray was first recorded in around 1286 as Kellibregh which is Cornish for “dappled grove” as agriculture was the main industry until the 19th Century. Not many of our walks take us though industrial estates but this one did! Leaving the industrial estate behind, we walked back up to Kit Hill through fields where sheep were grazing, and we had excellent views not only of the landmarks on Kit Hill but also as far as Plymouth sound. Everybody enjoyed the walk (I think) and their lunch (I know). We saw some interesting fauna during our walk: frog spawn by the quarry, alpacas, llamas and even guinea pigs roaming in a large outdoor enclosure in the Tea Rooms car park. UNFORTUNATELY DUE TO PROSPECT OF HEAVY RAIN THIS WALK WAS POSTPONED. 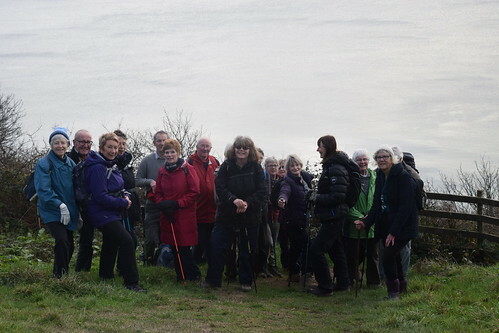 WE HOPE TO DO THIS SHORT WALK AGAIN ON 26TH FEBRUARY- OUR NEXT SHORT WALK SLOT. WE WILL SEND OUT NOTICE AS USUAL WITH A REPLY DATE. OUR NEXT LONG WALK WILL BE ON THE 12TH FEBRUARY AND ANNIE WILL BE SENDING OUT NOTICES FOR THAT ONE IN DUE COURSE. COULD ALL, INCLUDING THOSE WHO HAVE ALREADY BOOKED, LET US KNOW IF YOU WOULD LIKE TO DO THAT OR GO STRAIGHT BACK TO LOSTWITHIEL AND I CAN PLAN TRANSPORT ACCORDINGLY. COULD YOU LET US KNOW BY SATURDAY 26TH IF YOU WANT TO COME AND IF YOU CAN OFFER TRANSPORT. WE WILL MEET AT COMMUNITY CENTRE AT 10.25AM FOR 10.30PM DEPARTURE. Despite the warning of a difficult walk in places another good turnout of 19 walkers met at Hannafore Point to catch the Plymouth bus to Hessenford Copley Arms to start our walk on fine day with the prospect of some sun. The path boarded along some of its length through to the Seaton Valley Country Park follows the River Seaton for most of its way. The park was formally opened in 1998 and covers over 50 hectares. At the sea side our expectation was The Pink Van to have an early lunch but to our disappointment it was not there but luckily the Beach Café was open and we all sat under part cover to eat some tasty food. Before we set off we had a group photo whilst we were all still in good fettle. After a good rest we prepared ourselves for the moderate/difficult bit along the coast path to Looe. Going uphill out of Seaton up a stiff incline first on the road and then on the path itself we all pushed on and did very well past the Monkey Sanctuary entrance, the farm shop on the side of the road and towards Bay View Holiday Park and to Millendreath Beach with the hundreds of villas and apartments on the valley sides and a bar and cafe-not open on our visit. We stopped on the benches to partake of some cake to celebrate Janet's birthday-which was in November but that walk had to be cancelled. With the view of Looe Island getting closer we arrived in Looe near the harbour just before 3.00pm and time to return to our cars at Hannafore. However seven of us managed to make room for a cup of tea and three of us a scone or tea cake! 1) WE WILL BE CATCHING THE 10.09AM NUMBER 72 BUS FROM HANNAFORE POINT TO HESSENFORD-BRING BUS PASSES IF YOU HAVE ONE. 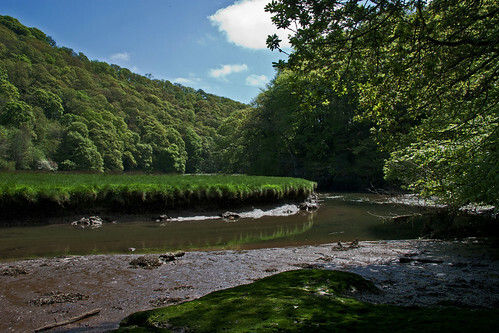 2)THIS 6 MILE WALK IS CLASSED AS EASY ON THE RIVER VALLEY STRETCH BUT MODERATE/DIFFICULT IN PLACES ON THE COAST PATH WITH SOME HILLS AND GATES BUT NO STILES. STICKS WILL BE USEFUL AS MUDDY IN PLACES. 3) WE ARE PLANNING A STOP AT SEATON FOR EARLY LUNCH/SNACK AT PINK VAN WHERE TOILETS ARE ALSO AVAILABLE-VARIOUS SNACKS/MEALS SOLD TOGETHER WITH HOT DRINKS. YOU CAN OF COURSE BRING PICNIC LUNCH. 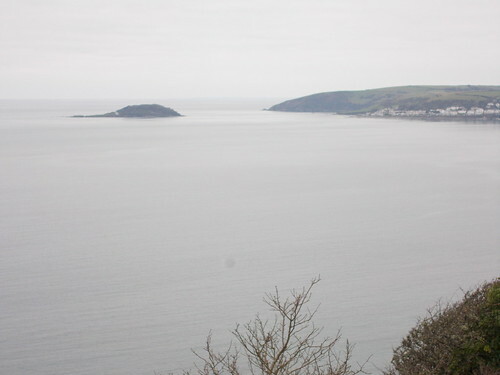 4)ON TRIAL RUN WE WERE BACK AT LOOE BY ABOUT 3.00PM. IF YOU COULD LET US KNOW BY SATURDAY 5TH IF YOU WOULD LIKE TO COME ON WALK AND IF YOU ARE ABLE TO OFFER A LIFT. A WALK TO GET RID OF THOSE CHRISTMAS INDULGENCES AND START OUR NEW WALKING YEAR.